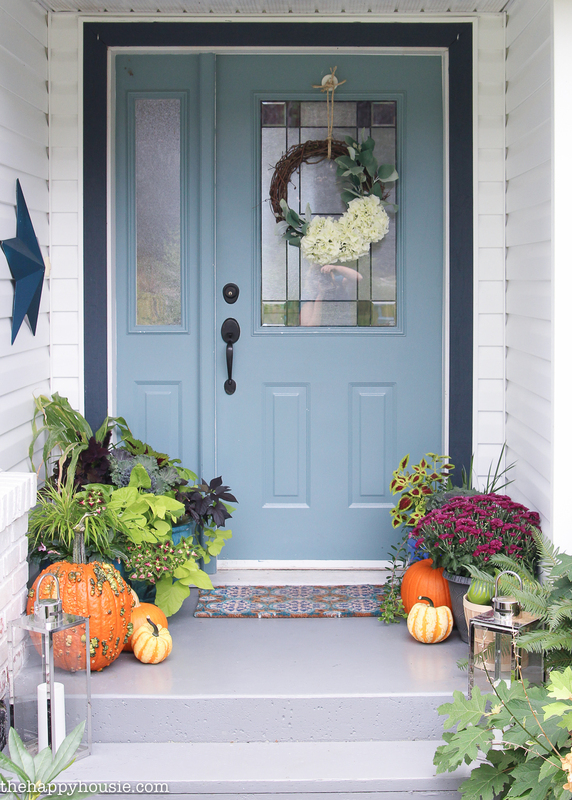 Today I’m sharing our simple fall front porch decor as part of the Seasonal Simplicity Fall Porch Hop. Be sure to check out all the beautiful inspiration at the bottom of the post! 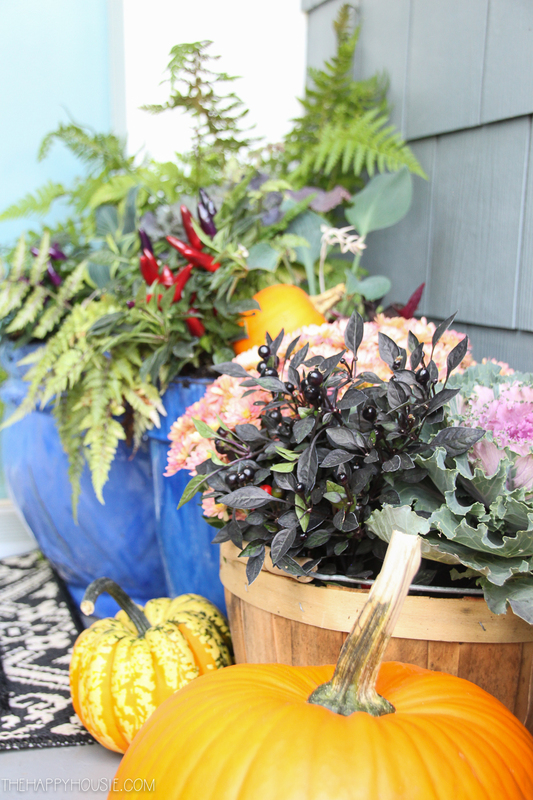 As much as I love cheery summer planters, I think that transitioning our porch to Autumn is one of my favourite seasonal decorating tasks! I mean, when your porch is this tiny, there is only so much you can do to it. Which makes it a quick and easy task as well. You can spruce up your summer pots with so little effort. 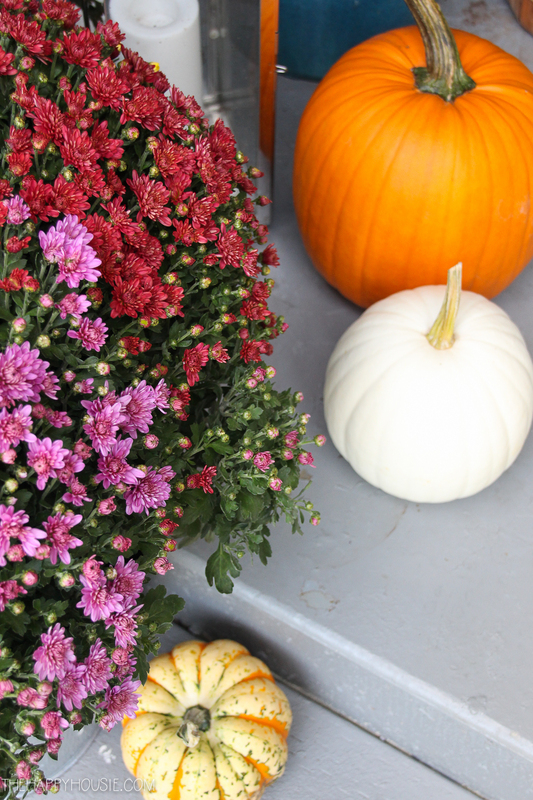 Throw in some winter kale, some little pepper plants, some mums, and top them off with a couple of mini pumpkins, and your porch is suddenly a fall wonderland! Add a few bigger pumpkins to fill up the gaps on the ground, and you’re done like dinner. Did you ever see how it looked before? The door is the same, and the concrete… even some of the bigger pots are the same. But the siding and soffit changes made quite a difference, amIright?! I’m liking it just a weeeeeee bit better this way. The door may get a refresh one of these days, but for now I’m still enjoying it and the colour I chose a few years back: Aegean Teal by Benjamin Moore. I’m sure you’ve noticed the layered mat trend that is floating around the blog/IG/home decor world? I decided it was time to give it a go, and picked up these two lovely mats at HomeSense. I must admit I was making a mess of the aisles as I tried out various combinations. I love it because, as cute as the coir mats are, they always look too tiny in front of the door. And I think the layering just adds that little extra bit of cozy for fall. 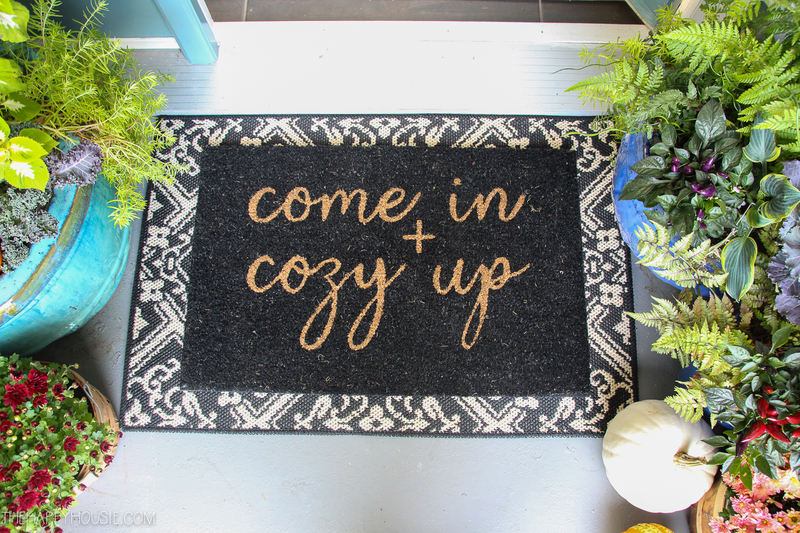 Plus, the mat says cozy, so how fun is that? I also shared the tutorial for that wreath on the blog a couple of weeks ago. It’s still one of my favourite DIY wreaths. EVER. I love how high-end looking it is… on a totally reasonable budget. Head over here to learn how I made it. Oh, there’s a sneak peak at another layered rug situation. 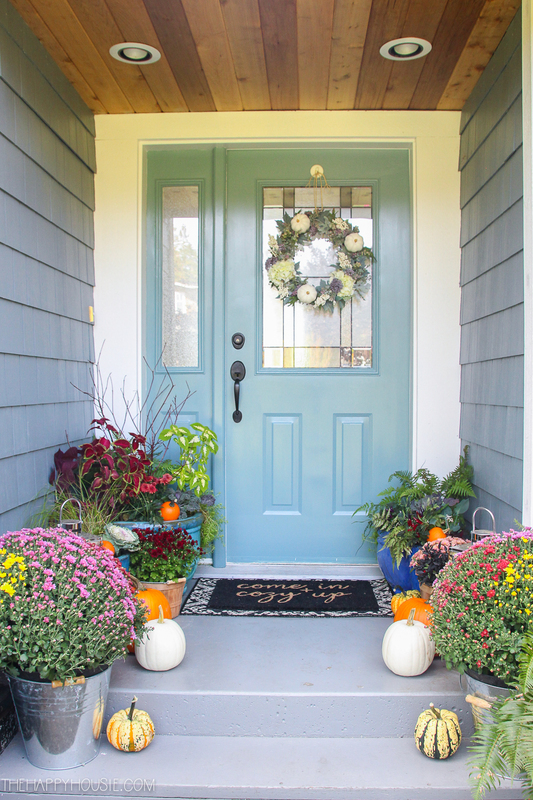 You’re welcome to come in and take our full of blues fall home tour! I shared our freshly re-painted entry/foyer/hallway in this post. And I shared our living/dining/kitchen tour in this post. 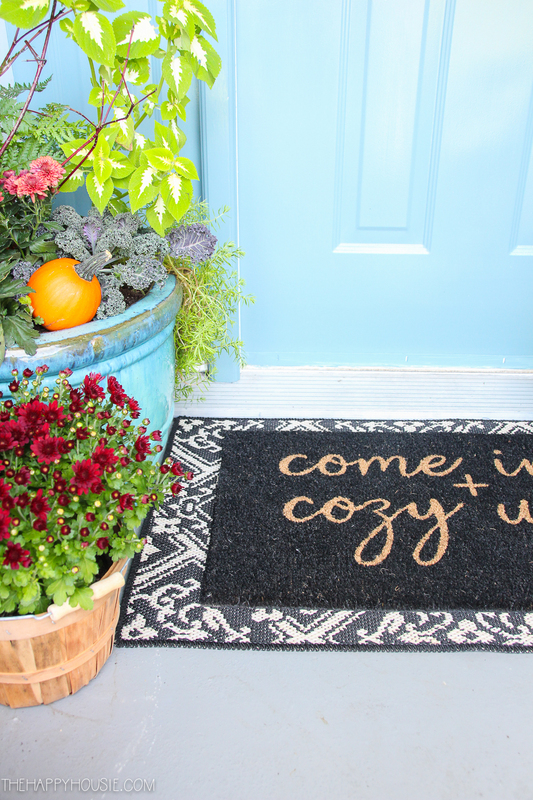 Want to try a layered rug situation on your porch this fall? Check out these pretty options! Just make sure that you are buying them sized correctly so that the coir mat is small enough to leave a decent sized border showing on the flatter indoor/outdoor rug. I love the door and the layered rugs! So pretty!!! I loved your wreath. I did a pretty good copy, if I do say so myself. One question, did you hang it from a Command hook? Thanks. Hi Sue! Glad to hear you loved it and that it turned out so well! I’d love to see a picture:) I hung mine on the door using a magnetic wreath hook that sticks to our door – but a command hook might work as well if it were designed for indoor/outdoor. I’m a newer follower. 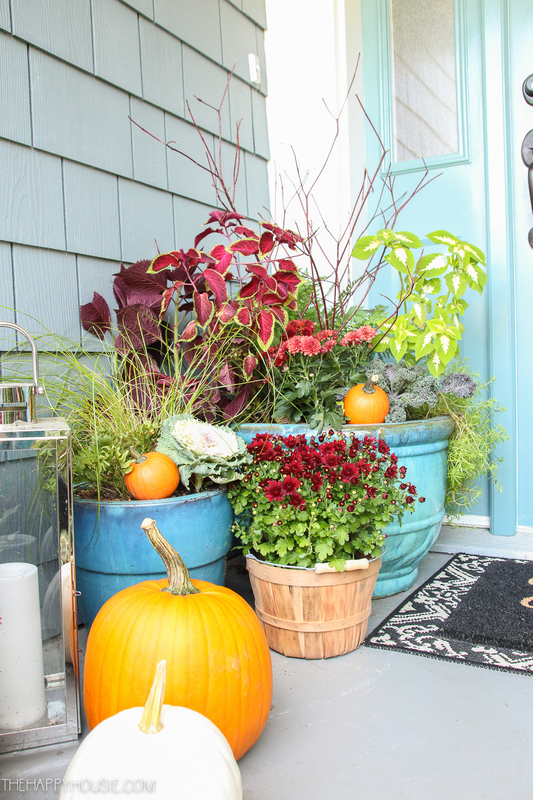 Your porch looks wonderful and love bushel baskets. They had nice texture. I’m looking forward to decorating our porch. Kale and soft pumpkins with other touches are my choice this year. 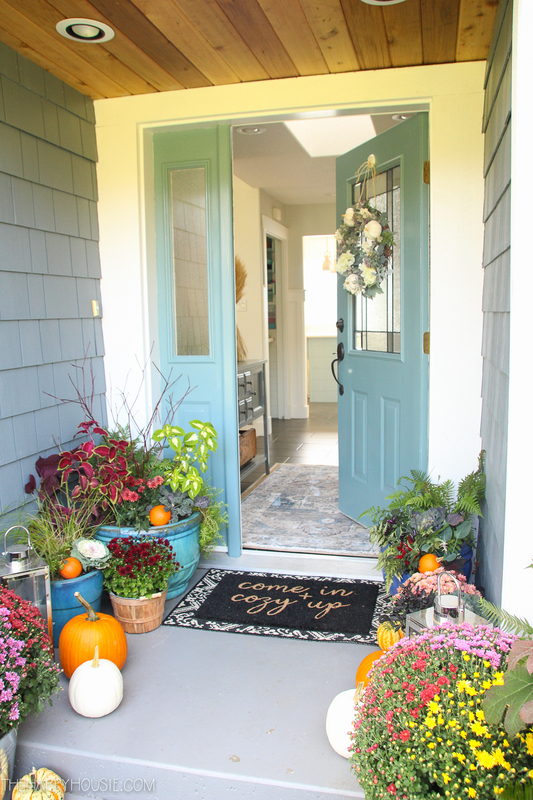 Your new siding made such a big difference to your entryway…it’s SO gorgeous! 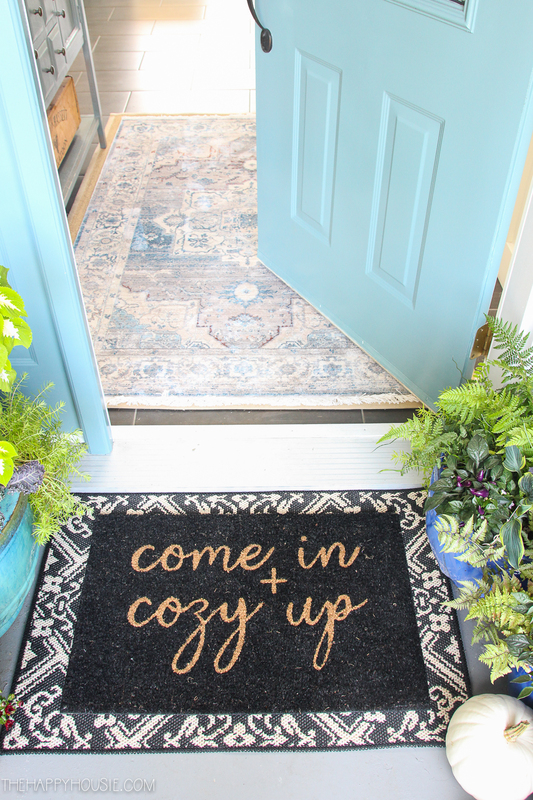 And I love your fall wonderland…the rug layering is such a cozy idea too! Your door refresh looks SO good Krista! And I love all your mums and wonderful fall colors! 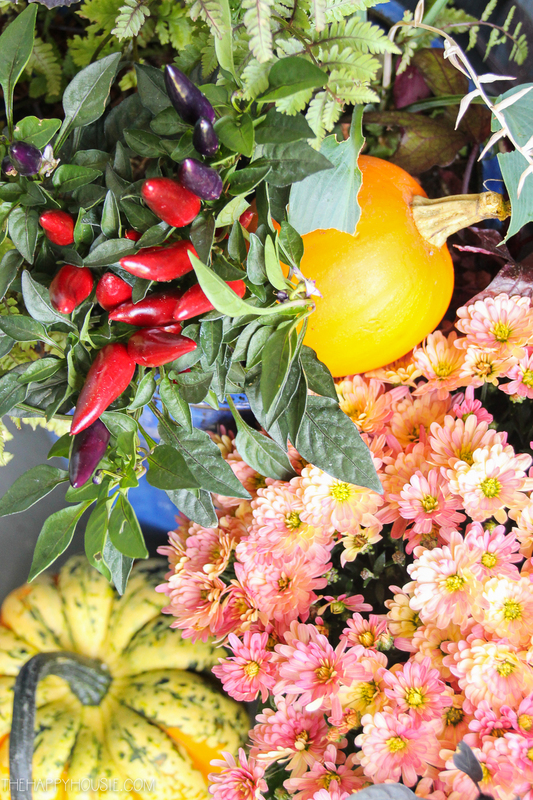 Thanks so much for including me – and happy fall to you! 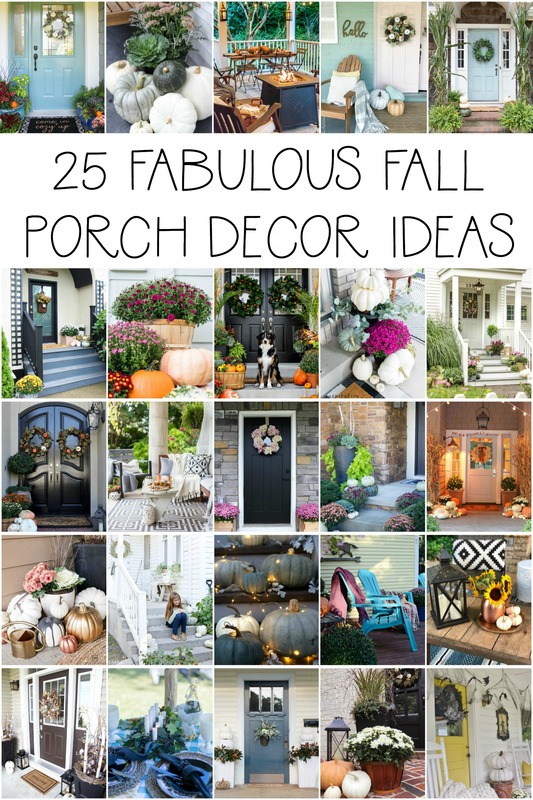 I love how you’ve decorated your porch for fall, Krista! 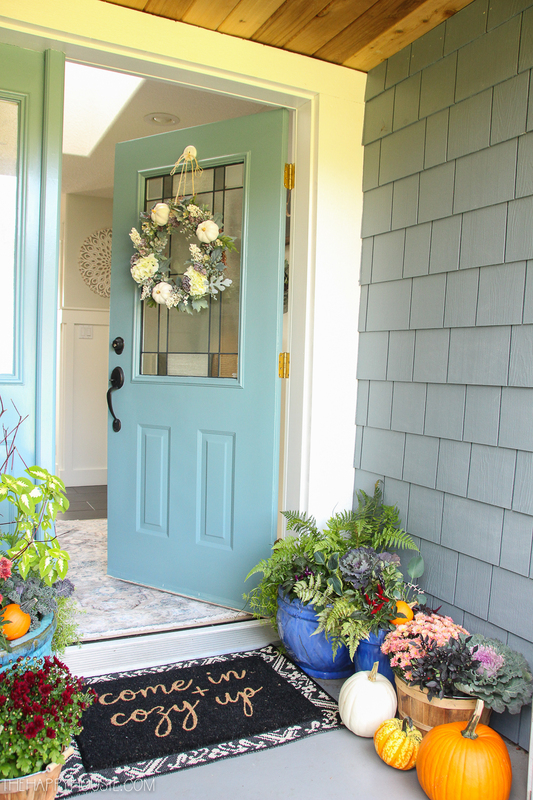 And every time I see an aqua door it makes me want to paint mine– yours is gorgeous! Thank you so much for organizing us for this fun tour! So gorgeous Krista! 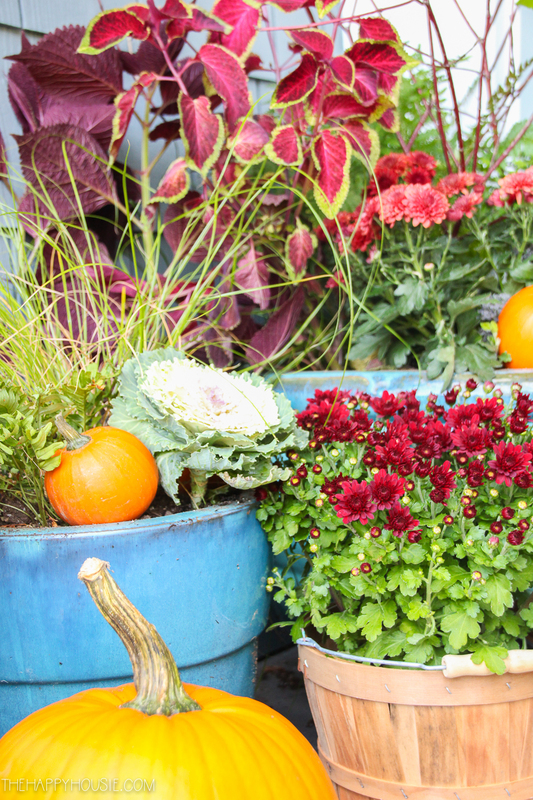 Love all of your beautiful fall plants! So pretty! Your door color is so charming! Thanks for hosting such a wonderful hop! It is so fun. Your work amazes me!! I absolutely love this porch!! Looks great! I love all the color! And, of course, that new siding is beautiful. 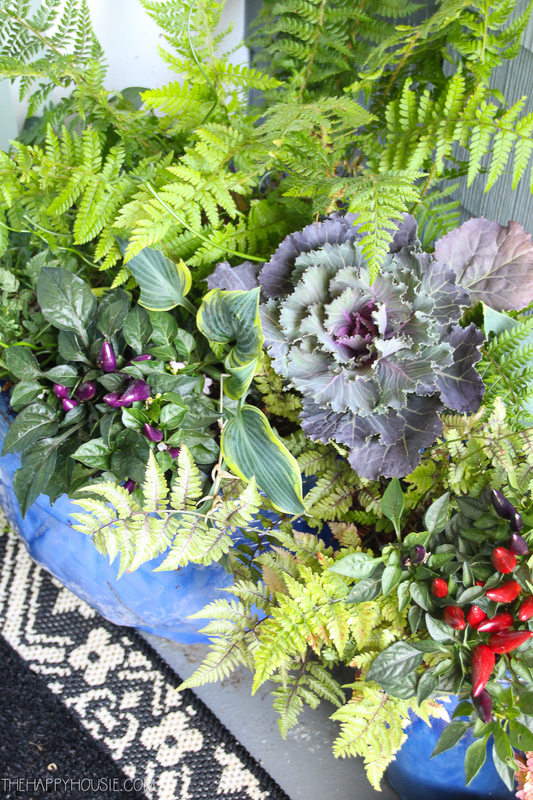 Krista, I love tour pota fillwd wirh fall plants – so gorgeous!!! Thank you for hosting such a fun tour! 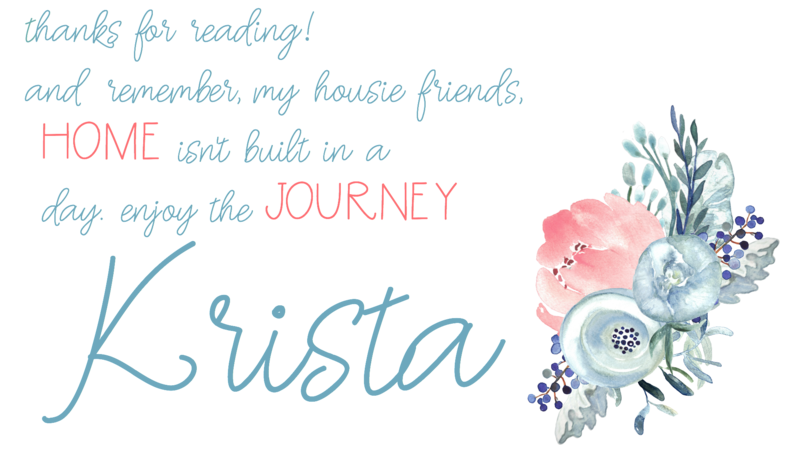 It’s perfect, Krista! It just the right amount going on. I love those little peppers, super cute! !